This drill runs out of both ends at the same time. Place four equal lines of forwards at the blue lines. Opposite lines have pucks with coach as shown in diagram. Place pucks at opposite corners. Two lines of defense in opposite corners as shown in diagram. On the whistle the coach dumps a puck behind the net. D1 skates forward to the dot, transitions backwards, pivots, and retrieves the puck behind the net. F1 skates down the wall into breakout position receives a pass from D1 and give a pass right back to D1. D1 receives the puck back from F1 and makes a stretch pass to F2 in the neutral zone. F2 takes a shot on net, stops for any rebound, and then skates to the corner to retrieve puck #2. F2 carries puck up wall and makes a back door pass to F1 as they drive the net. F1 stop in front after receiving pass from F2 and then goes to retreive puck #3 from the corner. F1 makes a pass to D1 at the blue line and then goes to the net for a screen or tip. Defense work on good footwork on transitions and pivots. Stay inside the dots for "Bump Back" from F1. F2 needs to control speed and have good timing for stretch pass from D1. 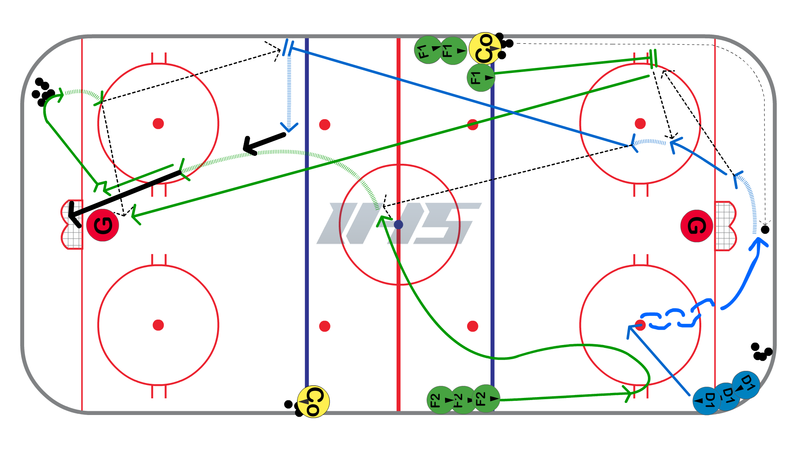 Great drill, keeps players on their toes!